Chris OGrady was forced off with an injury on his United debut. 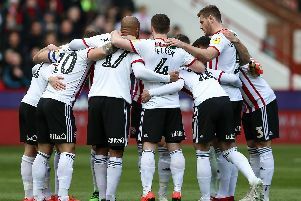 Sheffield United were booed off after losing 1-0 against promotion rivals MK Dons at Bramall Lane tonight. Highly-rated youngster Deli Ali hit an 87th minute winner, tapping in from close range after United failed to deal with a set-piece. It was Ali’s ninth goal of the season and the result leaves Nigel Clough’s side without a win in three matches. MK Dons substitute Danny Green was given his marching orders in the dying minutes following two bookable offences but United failed to find an equaliser. Chris O’Grady made his debut for the Blades, replacing Michael Higdon in Nigel Clough’s starting eleven. Jamie Murphy partnered the on-loan centre-forward in a two pronged attack. MK Dons named leading scorer Benik Afobe on the bench as manager Karl Robinson rotated his squad. Former United defender Kyle McFadzean featured at the heart of the visitors’ rearguard. The hosts made a bright start and Chris Basham tried his luck from just outside the penalty area but David Martin was equal to it. Basham was inches away from connecting with Bob Harris’ low cross in the 20th minute as United pressed for the opener. Clough’s men were dealt a big blow midway through the half when O’Grady was forced off with an injury and replaced by Marc McNulty. MK Dons continued to frustrate the hosts, with Jamal Campbell-Ryce denied by Martin before Paddy McCarthy headed over a corner. After the break, McNulty’s long range drive was well gathered by Martin. Moments later, MK Dons threw on former Sheffield Wednesday loanee Benik Afobe, who grabbed a hat-trick in their 6-0 success over Colchester last weekend, to increase their attacking options. But the tactical change failed to change the pattern of the contest as Jamie Murphy forced Martin in a good stop. However, Ali had the final say as United suffered their league defeat of the campaign. SHEFFIELD UNITED: Howard, Harris, Basham, Flynn, Doyle, Murphy, Scougall, McEveley, Campbell-Ryce, McCarthy, O’Grady. Not used: Baxter, McNulty, McGahey, Higdon, Reed, Turner, Adams. MK DONS: Martin, Hodson, McFadzean, Kay, Potter, Reeves, Grigg, Spence, Baker, Alli, Powell. Not used: Flanagan, Green, Bowditch, McLoughlin, Baldock, Afobe.